Sudan was the last male white northern rhino in the world — and there will never be another animal like him. It was a sunny morning in Kenya on Saturday as people gathered to remember an individual who was truly one of a kind. Sudan, the last male northern white rhino, died of an age-related illness just last month — and the people who had been caring for him at Ol Pejeta Conservancy, 24 hours a day and seven days a week for nearly a decade, were truly heartbroken. 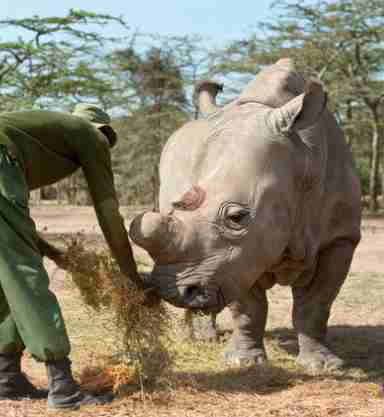 Sudan was 45 years old, quite old for a rhino, and was surrounded by the people who loved him when he passed. 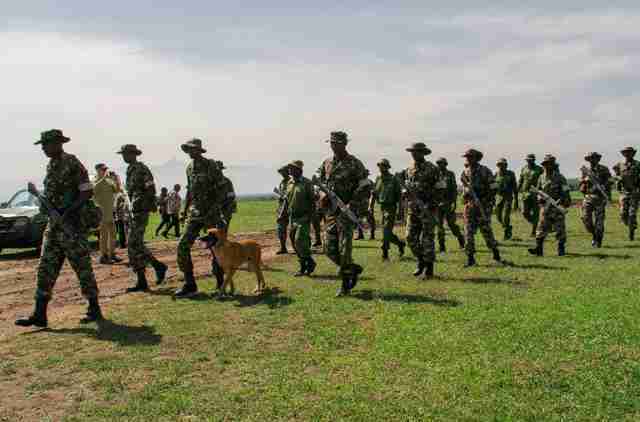 And the team of people at the conservancy —including armed guards and guard dogs who still protect the last two northern white rhinos on Earth (Sudan's daughter and granddaughter, Najin and Fatu) against poachers — gathered together to remember him. 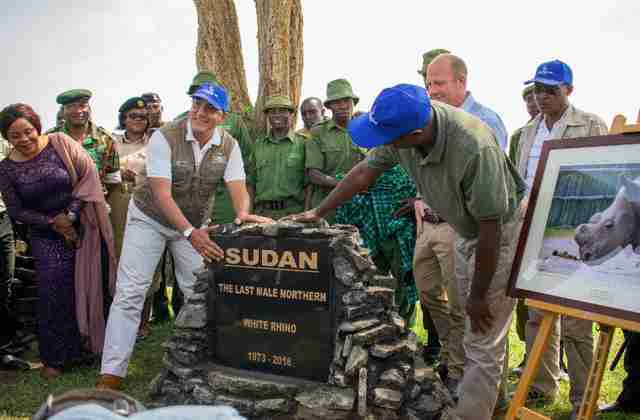 They unveiled a stone memorial with Sudan's name on it, placed under the shelter of a tree. "This morning, we gave Sudan, the last male northern white rhino, a fitting tribute in honor of his life and his great work as a rhino conservation ambassador," the conservancy wrote on Facebook. "Several speakers gave great personal accounts of their interactions with Sudan and his incredible global impact on rhino conservation." 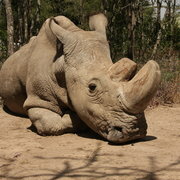 Sudan helped people around the world understand the threats facing rhinos everywhere. Because of demand for their horn in Eastern medicine, poaching has ravaged rhino populations. It used to be that millions of rhinos roamed across Africa and Asia; it’s estimated only about 30,000 remain between all five species combined. Ol Pejeta is working with scientists to try to use in vitro fertilization to save northern white rhinos from total extinction. A southern white rhino would be a surrogate and carry a northern white rhino embryo created in a lab from eggs harvested from Najin and Fatu, the last female northern white rhinos. Sperm samples from now-deceased northern white rhinos are currently stored in Berlin, Germany, as a last-ditch effort to save the subspecies. While the fate of the whole subspecies hinges on this never-before-tried procedure in rhinos, people are hoping that Sudan will always be remembered and that his life will remind people just how vulnerable animals are to human impacts. 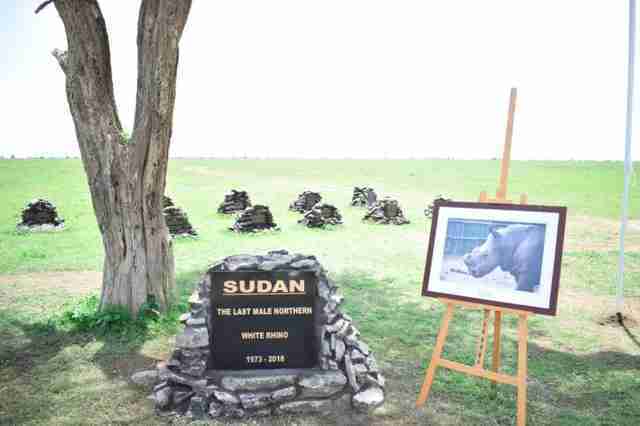 "Fare thee well Sudan," Ol Pejeta wrote. "You have done your work to highlight the plight of rhino species across the world; now the onus is on us."